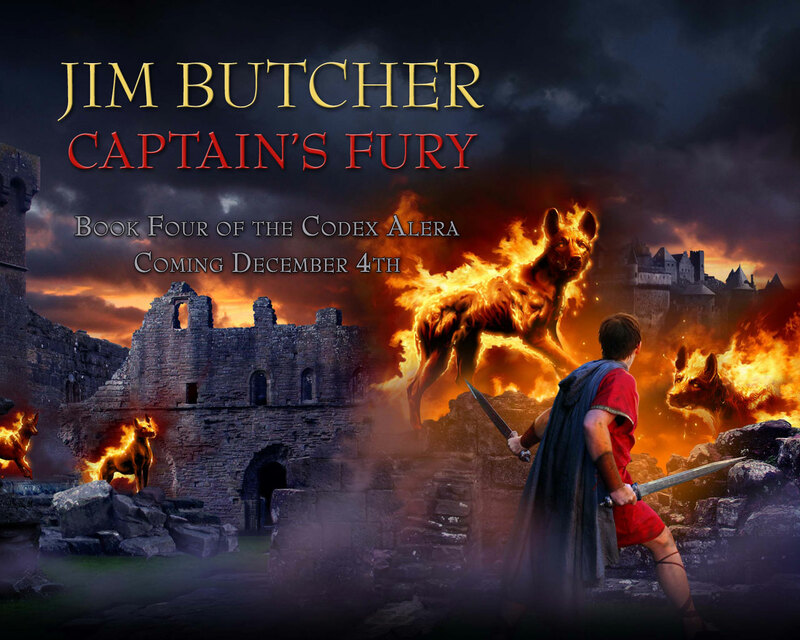 Jim Butcher‘s series, The Codex Alera, is well worth a read. Captain’s Fury is book number four in the series. In it we meet a Tavi two years older from who he was in Cursor’s Fury. The hard work that Butcher puts into his books shows. He himself says that being and author is about work, work, work and not giving up even if you are rejected. I guess I must have been wrong about the Muses just dropping into people’s heads and taking over their hands. I love it when I can tell that an author has worked for my pleasure. How selfish is that? However selfish, it is true. There is just something incredibly wonderful about an author that takes hold of me and brings me into their text. That is the kind of author Jim Butcher has become. Tavi is yet a couple of years older. As a character, Tavi is a warm-hearted person. Somehow he feels that friendship is possible with everyone and works toward that end. Unfortunately, not everybody agrees With that point of view. Senator Arnos is one such person. His goal in life is to destroy Tavy but also to destroy the Canim with what he considers Aleran superiority. Boy is he in for a surprise. Sadly, Tavi will be impacted (in the shape of Captain Rufus Scipio) by Arnos’ scheming and Tavi’s captaincy hangs in a thread. When Tavi discovers who he really is, his life is not made any simpler. The First Lord is quite a schemer himself. He knows that he is more or less alone in his battles and seeks a quick resolution to the problem of Kalare. That means that Gaius will have to og undercover and absent himself from the political infighting in Alera. To assist him in his quest, the First Lord brings along his faithful Amara and her Bernard.